It’s the fourth night of Ramadan, the ninth month of the Muslim calendar. It is a time of contemplation, of family, of fasting during the day and eating small meals at night. In Australia, as the days begin to get longer, there are an extra set of challenges. Many young men, low on energy during the day, and emboldened by full bellies in the evening, find themselves at a loose end. In Melbourne’s northern suburbs, where the majority of the Muslim population lives, Ramadan can be a frustrating time. Many recent migrants live in this area, having come over from such places as Eritrea, Somalia, Ethiopia, and other parts of North Africa with their parents when young. Torn between familial duties and religious observance on the one hand, and the tempting opportunities of a more affluent society on the other—and hemmed in by a lack of education, access to services, and a sense of being “outsiders” in their new communities—these young men often end up feeling frustrated, alienated, and at a loose end within their own new “homes”. It’s a phenomenon by no means unique to Melbourne. In fact, the underlying reasons for this marginalisation are repeated over and over. Just as my family came to Australia in the ‘20s, and naturally gravitated towards other Italians in the community; just as the Vietnamese who came over during the ‘70s gravitated towards a burgeoning Vietnamese community. It’s natural. On the other hand, it can contribute to an “us and them” sense of disquiet within local communities. In years gone by, during Ramadan, the young men of this community would congregate after sundown, and another day of fasting, and do what came naturally, and what everyone could do equally, and freely. They would play football. Until 1am, 2am, 3am, they would mill about under the bright lights of the commission housing buildings, talk, play, laugh and relax. Of course, at 3am, with footballs flying about everywhere, and laughter ringing out in front of many, many bedrooms windows, other people, other microcosmic communities within these towers, who had not been fasting all day, would ring the police and complain. The gatherings would be broken up, the men would disperse; the alienation and the sense of “outsider-ness” would be confirmed. 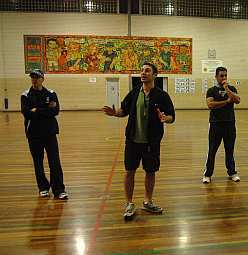 This went on until 1999, when the Carlton YMCA, the Victorian police, and St Jude’s church put their heads together to try and provide a solution. The solution was the Ramadan soccer program that has been running ever since. The focus of the program is providing a community space for these young men. From small beginnings, the program has grown every year. Last year, an average of 39 young men played every night, with more watching from the stand in the YMCA building’s stadium. Meanwhile, out on the court, it's 11pm and time for the games to get under way. The first game for the night is Carlton Blues versus Eritrea. 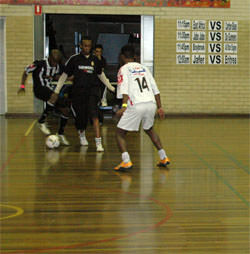 The games are fast and hotly contested. Tonight is finals night, with the last game scheduled late. The uniforms of the players represent a wonderful cross-section of (mostly) European teams, with a predilection for the French national team shirt, and other French sides such as Arsenal apparent. 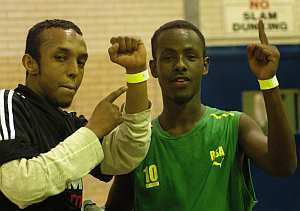 Brightly coloured wrist bands denote who is playing with and against whom. I stop to chat to Bill and Phil, two of the three officers present for the night. They are over from the St Kilda Road station for the night, helping out Carlton. They think it’s a great program, can’t comment about the funding application, of course, and are otherwise happy to be here. As we chat, Bill is grabbed for the next game, Jaba Jaba versus Da Gunners. A goalie is needed. Mia introduces me to Abdul Rashid. He has been playing here since the program began, she says, and knows more about this program than anyone. 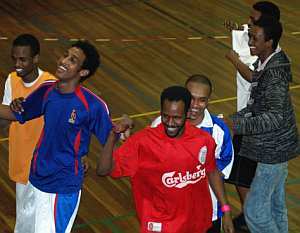 Abdul and I have a conversation that ranges over the World Cup final, which teams we follow in Europe, how long he has been here in Australia—he came over from Eritrea when he was 12—and what he thinks of the program. He heads off to chat with friends who've just arrived, and I settle in to watch for a while. Mia comes out to announce that the sausages, donated by Medina meats, will not be free tonight, but will cost $1, because of damage to the toilets on Monday night. She is greeted by some light jeers, and disinterest. It is between games, and people are chatting. I find myself wondering whether they will sell any sausages at all tonight. I wander over to the office after the announcement and the next game has begun. I ask her if $50 will cover the cost of sausages for tonight, so they can be free, like they usually are. She is surprised; I have been inspired by the work being done here. She smiles, but says no. “It’s not really about the money; it’s about the bathroom on Monday night, and about consequences. The money from sausages will not cover the damage to the bathroom. But the guys who come here have to understand that there are consequences to their actions.” She goes on to explain that, just as the program aims to bring these new Australians “into the fold”, so it must also make clear that participating in society involves responsibilities, and not just privileges. 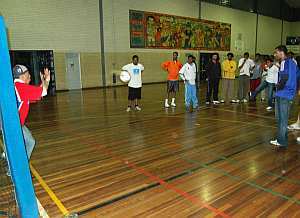 The work the community centre does is not just focused on providing a space for football one month a year. There are outreach programs, homework programs, excursions—a wide range of activities designed to bring people "into the fold". The challenges for a new migrant can be immense. Sometimes they have to be addressed, looked squarely in the face. Sometimes it is good to forget it all, play some football, and feel at home. What a gentle, warm reflection. Congratulations on a fantastic article: you've captured the mood perfectly. I think this was quiet a good article. I had no idea that things like this went on. good to see the police involved in such activities, and for there to be some sort of 'outreach' to muslim communities occurring.